Procedural issue with planning board vote cited as reason to start over. Rappaport said Martha’s Vineyard Commission executive director Adam Turner had confirmed the permanent tower will not have to go before the MVC again, provided there are no changes to the proposed structure. If the permanent cell tower is ever installed, it will be 11 feet taller than the current 104-foot temporary tower, with exterior antennas. Although the board voted to approve the special permit for the permanent tower 4-1 on April 3, the validity of the vote came under scrutiny after it was discovered that board member James Cisek, who was an alternate until the untimely death of Robert “Coo” Cavallo on Jan. 1, had not attended some public hearings during the six-year process. In light of the discovery, on April 12, lawyers for AT&T wrote a letter to the board asking to allow the application to be withdrawn. Dianne Tillotson, attorney for Robert and Dana Strayton, staunch opponents of the tower who have already sued the MVC over its approval of the permanent cell tower, contended the actual vote was 3-1, short of the required 4-1 supermajority, and the permit should be considered denied. Attorney Arthur Kreiger, representing AT&T, said if the board voted to allow the application to be withdrawn, AT&T would be willing to start the permitting process all over again, and asked the board to move apace. The board also voted unanimously to extend the special permit for the temporary cell tower until May of 2019, or six months after all litigation is resolved, with members citing importance of public safety and documented incidents where the temporary tower had enabled emergency communication. This is a joke….it was approved and the people suing, well we all know what they are. They bought their house (their summer home, they don’t live here year round) when there was a tower already there….why are they still complaining?? It was approved, everyone wants it but them, so why don’t they just move? Wouldn’t that solve the problem?? Why don’t they just MOVE??? I am not even sure where to begin on the inaccuracies contained in this story, but if you want to discsuss the facts, I would be all to happy to do so. The problem is that the MV Times blocks about 98% of my comments because truth and integrity are secondary considerations. My recommendation to everyone in this age of “fake news” is to read the seminal work of MIT professor, and political commentator Noam Chomsky entitled “Manufacturing Consent.” The town, AT&T and the media have been lying to you. Funny thing happens when you sue, you get discovery, and in the discovery is truth. I know the truth, and the town and the media hate me for it. I have tried to get them to print the truth, but they won’t even run my comments. Not sure where you live Islanddogs2, is it within 200′ of this proposed tower? The real truth, is that there is no need for a tower in this location, there are over 50 sites on Chappy where a tower could be sited. Locations away from everyone’s homes, that provides better service to more people. The other fact, is what happened last night had NOTHING to do with me, and everything to do with the most basic functions of government. Don’t blame me, the vote was held, and the tower at Sampson Ave was DENIED! It was only because your town government couldn’t do its most basic job that we are where are. FACTS PEOPLE, FACTS! This sounds familiar. Who else do we know who yells fake news about things he doesn’t like, lies all the time, and inappropriately uses all caps? It is not a fact that we have blocked 98 percent of your comments. As you know, you had an issue with your log in and on the same day it was brought to our attention, we helped you rectify it. As for inaccuracies, we are looking at what you’ve sent us and if there is any correction to be made, we will make it. George and I discussed this in email, the fact is, the MV Times has blocked many, perhaps 98% is an overstatement, sorry, but many of my posts. That’s the Truth. particularly When I have named names and directly quoted AT&T emails. Doesn’t actually change the fact that nothing that happened April 3 had anything to do with me. How about some honesty here? Two of my very good friends are on various SWAT teams. One, spent his honeymoon in my house on Chappy. Know what he did after that? He pulled Dzohkar Tsarnaev out of a boat in Watertown. Yeah, he was THAT guy. One of my grandfathers spent 42 years in FDNY, the other was killed on the job when I was an infant. I am all about public safety and supporting our first responders. I have never denied the value of a Chappy cell tower for public safety reasons. But honestly, how many times in your life have you called 911? I’ve called twice, once for an elderly man that had fallen, and once because of a car accident I witnessed. There really aren’t that many true emergencies on Chappy. Look at the Fire Department stats published every year in the Annual Report. So for everyone that doesn’t live on Chappy, let’s be honest about why you want a cell tower on Chappy? It’s not for emergency communications is it? For those of you that don’t live on Chappy, and just want a tower so you can upload selfies of the fish you caught, or great time you are having on East Beach while your roomies sweat it out in NYC, why do you care WHERE the cell tower is? You will still be able to upload to Twitter and Instagram and Facebook. You’ll still get the “hot chicks” Snapchat. You just won’t be doing it at the expense of your neighbors health, welfare and property values. 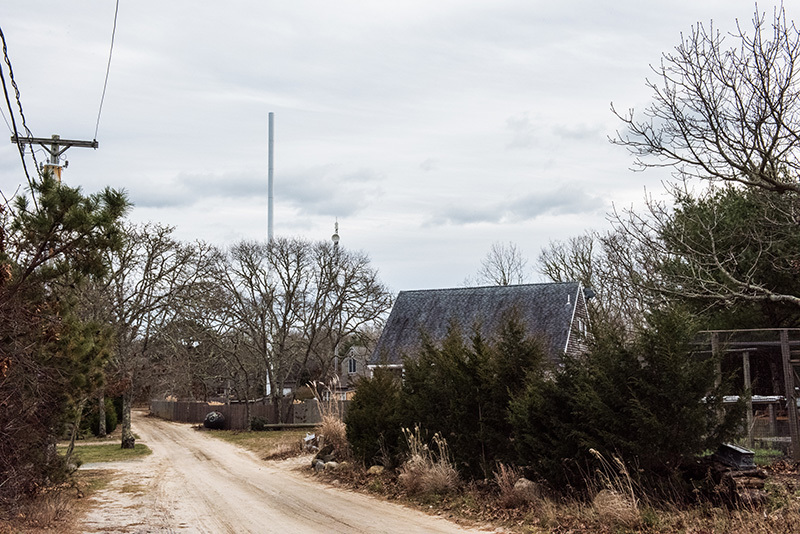 There are better places on Chappy for a cell tower than in the middle of the most densely populated neighborhood on a largely unpopulated island. How’s this for an agreement: If anyone can give me a good, valid reason WHY a cell tower MUST be placed at Sampson Ave., I will drop my suits, and move out. But, if you cannot give me a good valid reason, you agree to write a letter to the Edgartown Planning Board objecting to Sampson Ave, and demand that the Town find a better, safer, less impactful location among the 50+ choices it has? You win, I leave, I win, you join the hundreds of us opposing Sampson Ave. Until then I am going to continue to fight for my rights, and the rights of my neighbors, and people that oppose this LOCATION across Chappy, across the island, and across this country. Honestly, I really don’t understand why more of you don’t stand with your neighbors. The people in this neighborhood are Islanders, lifelong Islanders. They aren’t the billionaire investment bankers in Katama. They are carpenters and truck drivers, landscapers, ferry captains and school kids. Why would you ask the town to hurt your own, when there are better safer alternatives that provide all of the benefits and none of the detriments? I just don’t understand. Can someone explain that to me? Has it ever been explored to add some height to the current existing permitted towers off pennywise path or north street? What about on the non-blade side of the windmill at morning glory farm? Or on top of the water tower at mill hill? Or within some of the church steeples? (its done all the time) , or the roof of a hotel/commercial downtown building? ( its done ALL the time off-island) Cell phone companies have portable ‘cell’s that are used all the time, which do not require the height/line of sight of A single tower, so perhaps a few of those could be put in place at less cost without negatively impacting any residential properties. Rstrayton, so, there aren’t that many true emergencies on Chappy?? Do you want to chance that? What if it were your friend or loved one that needed life saving help and you couldn’t call because of lousy service. The vote was denied because Coo died and the alternate didn’t attend all the meetings over the 6 YEARS that this has dragged on. Fake news….I am so sick of hearing this….you are promoting fake news with the implication that the MV Times wouldn’t publish your comments (see George Brennan comments). So there are HUNDREDS OF PEOPLE opposed to the tower on Sampson Ave? Why are we only hearing from you and your LAWYER. Why don’t they print stories or comment here? I would love to hear another point of view from someone else (that opposes) besides you. One more comment, you bought your second home on Chappy when the temporary tower was there, you knew they were in the process of approval for the permenant tower. If you are SO OPPOSED to this tower, why did buy property at this location? Was it because you thought you could bully everyone and get your way and it wouldn’t get approved? Noam Chomsky really? do you know anything about the guys history? Some more facts, I have NOT sued the Planning Board. What happened on Tuesday night, and at the April 3, 2018 Planning Board hearing had nothing to do with me, nothing. Think you can handle what it was REALLY about? Think you can handle the truth? Thankfully, he has back-up, Georgiana Greenough, the Planning Board administrator’s primary job is to take the role, and to confirm who is, and who is not, eligible prior to a vote. Do you think, after 11 years, she forgot what her job was? But that’s ok, because she has a back-up, clerk Doug Finn, M.A. keeps the minutes and the attendance records, so he knows who is, and who is not, eligible to vote. Ooops, guess he forgot too? Don’t worry though, AT&T’s million-dollar lawyers are paid to know who is and who isn’t eligible. They are paid (a lot!) to monitor the public hearing process, to know who is and isn’t eligible, so they would call that out, you know, in the interests of fairness, truth, honesty and transparency. Or withdraw the application BEFORE a failed vote, not.. not after?? Funny thing is, my neighbors and I, as we went over on the Chappy ferry the night of the vote, discussed Cisek’s ineligibility, and the fact that there were only four eligible members. See, I double-checked the meeting minutes and the official role for each meeting, apparently some of my neighbors did too, since they brought it up to me. Sound like a familiar job? That’s why we were all so shocked when Cisek voted, he was ineligible, but I guess he just forgot he missed every single hearing, I guess Georgiana just forgot what her job is, and I guess Doug Finn forgot to back-stop her,”Ooops.. we’re sorry!’ Really?? That is the real story: extremely questionable, extremely suspect conduct by not one – but by all THREE people most responsible for knowing and declaring eligibility – on the same night?? Honest mistake? They all just “forgot” because this hasn’t been controversial at all? Or, a concerted effort to prevent a legal, binding 3 – 1 vote and denial of Sampson Ave? In fact, George and Barry and I have traded a couple emails on the subject today (World Press Freedom Day, btw) on the subject, tenor and tone of this article. And, on the failure to even ask the question: What happened? And why? The real question you should be asking, the REAL question the MV Times should be asking is WHAT HAPPENED? HOW did this happen? Why did this happen? And isn’t this a little suspicious? The other question I asked of both Barry and George, was what relevance did a suit against the MVC have to the extremely suspect conduct of town government? I haven’t received a private response to that yet, either. Oh yeah, and islanddog2, you must be thinking of the wrong house. And where do you live again, and what is your name? As for my neighbors coming forward, some have, the others may not want to be subjected to the vitriol and castigation one experiences for simply trying to do the right thing for Chappy, now, and for the next 20, 30, 50 years. Or, maybe they are just worried about feeding their families? Oh, and George, seems I have 2 logins (wonder why? ), maybe you could check to see if it was my RobStrayton posts that have been blocked? As for Dr. Chomsky (Penn, Harvard, MIT), it’s pretty obvious I do. I am not willing to capitulate my rights to a corrupt government, or sit by while a media, clearly predisposed towards corporate interests, denigrates my name and obfuscates my positions in an effort to maintain the status quo. The Town and the MV Times would like you to spend all your time railing at me. That way you take you eye off the real issues here: building a monument to corporate self-interest, political expediency, and poor judgement. Someone MUST have a reason why Samspon Ave is the best, only, most ideal location on all of Chappy? Let’s see if they run this one? Andrew- look it up, it’s a matter of public record that his house was purchased in 2015. Unless the record is wrong, then I stand corrected and apologize. I really don’t care if the to tower gets put up on Sampson or not, as I do not live on Chappy but I do live near the airport. I could constantly rail against the noise and the smell of fuel but what good would it do. It’s not my second home, it’s my only home. Good luck RStrayton with your efforts. The record I refer to is the the public database on the town’s website, again, if the record is wrong or incomplete, then I do apologize to Ratrayton. No, you are right. He bought it in 2015. Was no “vitriol and castigation“ prior to his arrival. Yes mistakes were made in a long and complicated hearing process. Could it be due to a long term community member and chairman of the board dying at the end of the process, or is likely a vast conspiracy by our friends and neighbors to get one over on us? I love when someone moves down here and informs us the work we’ve been doing for years is wrong and only they know the right way. It’s tiring. Chappyfool, I see you have not put forward any actual reason why a cell tower must be placed at Samspon Ave? Simply more personal attacks against me. As for this “long and complicated” hearing process, it was four public hearings, four. Quite frankly, Mr. Cavallo’s death is irrelevant to what happened. AT&T’s attorneys knew once he died that there was only a 4-person quorum remaining. It would have been normal for an applicant to withdraw its application then, not AFTER a vote. Those decisions did not have anything to do with me. AT&T chose to go forward knowing full well it had a 4-member quorum. As for “the work you have been doing for years” I would just point out that as late as August, 2015, the plan to place a cell tower was a 180-foot tower on Sampson HILL, on the Western side of the island, by Grain Communications. To jog your memory that was a 12-acre town-owned parcel of land. In testimony provided by the town, certain members of the then-cell committee objected to that site because it was “too close to their homes.” Really? 12 acres, too close? Again, to remind you, the “temporary tower” was slated for the 200-acre wooded parcel where the Trustees have its garage at Wasque. After a dispute over the amount of rent to be paid to the Trustees, it was then suggested that the temporary tower be sited at Sampson Ave, as an expediency, for the summer of 2016. Sampson Ave. was a 35 day hearing process. 35 days from application to permit. Sampson Ave was never vetted. In fact, AT&T never supplied an alternative site analysis for that site, as required by law, until AFTER the tower was erected. So the answer is NO, there was NO MENTION of a Sampson Ave tower until March 15, 2016. Long after I had purchased my home. Trust me, had there been, i wouldn’t have bought it. Do any of you really think this has been fun for me? I lived through this entire process, I remember every detail. So I guess the question becomes, what work, exactly, did you do Chappyfool? Were you one of the cell committee members that objected to the town-owned land because it was too close to your house? Were you one of the people that failed to look into Connect America Fund money? Were you the one that suggested it move to the most densely populated neighborhood on the island; that suggested hurting the very neighbors you claim to care so much about? There are better, more compliant, less impactful locations on Chappy to site a cell tower. That is an indisputable fact. I again challenge you to give me one sound, valid reason why a tower must go on Sampson Ave? As far as “telling you what you have been doing is wrong,” yes, I will always tell you when the town is circumventing, undermining, violating the laws of the Commonwealth of Massachusetts, and The Constitution of the United States of America. See that’s the funny thing about a democracy, citizens have rights, whether they moved here yesterday, or 150 years ago, same rights, same protections under the law. I will also point out, unapologetically, poor judgement, political expediency and corporate self-interest at public expense. I was speaking with a State Supreme Court Justice Saturday night, explaining what had happened in the public hearing process and showing him photos of the current temporary tower. I am pretty sure you don’t want to know his opinion on the matter. So Chappyfool, why don’t you step out of the shadows, state your name, and where you live. I have nothing to hide, what are you hiding? Keep railing at me. Don’t look objectively or honestly at the actions of appointed government officials. The elected members did their jobs, it is the appointees – that don’t have to face the ballot-box – that have undermined this process. And, yes, none of those appointees live on Chappy, none are effected by this tower on this site. Chappyfool, if you are so naive to think that what has occurred in this public hearing process, by three appointed members, was in anyway an “accident,” or acceptable, then you are aptly named. I guess no one really wants me to leave, since no one has taken up the challenge to provide even one single valid reason why a cell tower must be sited in the midst of the most densely populated neighborhood of year-round residents? I have provided many reasons why it should not be placed there, and I don’t really see anyone objecting to the arguments that there are better, more compliant, less impactful locations that provide all of the benefits and none of the detriments associated with a tower in the middle of densely populated neighborhood, mere feet from a public right of way. Inconvenient facts for the corporate special interests, billionaire investment bankers, and those that would saddle this least affluent, working-class neighborhood with a massive industrial development in its midst. Moving the tower to a safer, more complaint location deprives no one of service and preserves everyone’s right to the quiet enjoyment of their homes. Join us in doing what is right for this community now, and long into the future. Your children and grand-children will thank you!